Adobe is making it easier to work with PDF files stored in the cloud, thanks to a new partnership with Dropbox that connects users of the Acrobat PDF editing and viewing products with documents stored in the cloud storage firm's online locker. Starting Tuesday, users will be able to link their Dropbox accounts with Adobe's Acrobat Reader and Acrobat DC desktop apps, and then edit any PDFs they have stored in Dropbox's cloud from Acrobat, without having to go digging for the right file. On the desktop, that doesn't seem like much of a bonus, since it's already possible to open files from a Dropbox folder that's stored on a user's computer with those apps. However, the companies will soon be rolling out an integration for iOS so mobile users who would otherwise have to flip between different apps in order to open their files won't need to. As part of that integration, when users open a PDF in the Dropbox app on their iOS devices, a little bubble will pop up informing them that they can work more productively with the document using Acrobat. Having that bubble is a win for Adobe, which has to stand out among a sea of other PDF authoring and editing apps like Smile Software's PDFpen. Of course, it may also prove annoying for people who enjoyed the unblemished experience of using Dropbox prior to the integration. After the iOS features roll out in the coming months, Adobe and Dropbox will work together on similar experiences for Android users that are slated to launch next year. A similar suggestion feature will also show up in Dropbox's web interface. The Dropbox partnership is an interesting one, since Adobe's Document Cloud ambitions are primarily enterprise-focused. While Dropbox has a significant user base, its enterprise offering has largely lagged behind offerings from competitors like Google and Microsoft. Adobe plans to work on similar integrations with other storage providers in the future, and it's been cultivating a partner ecosystem around its Document Cloud beyond that, too. The company announced partnerships with Salesforce and Workday last month that are focused on integrating Document Cloud e-signature services into those products. Integrating with Dropbox is one component of a larger set of announcements Adobe made around its Document Cloud. 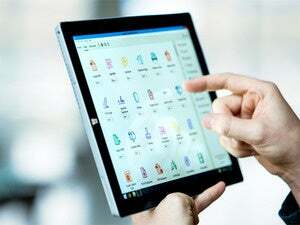 The service, which is primarily focused on offering electronic signature functionality, now has a drag-and-drop workflow tool that lets anyone with a Document Cloud subscription set up a system for passing a document around to multiple people for them to review and sign. Companies that want their employees to do more on the go can take advantage of new functionality that integrates with smartphones. Using the eSign Manager DC mobile app, employees will be able to take a photo of their handwritten signature and then use it to repeatedly sign documents. In addition, users can sync their signature across mobile, web and desktop apps so they can sign documents in a variety of locations. The Fill & Sign app, which lets anyone convert digital or scanned documents into electronic forms, is now also available for iPhone in addition to its existing incarnation on the iPad. All of this is part of Adobe's strategy to compete in a rough-and-tumble e-signature market against companies like DocuSign, which has made its entire business out of offering electronic signature products and has raised more than half a million dollars from investors and has an impressive client roll to boot.